Our Vials are 100% camera inspected for all critical parameters and are packed in clean room condition with 0.3μ Heppa Filters and Double Skin AHUs ensuring a dust free environment. We are leading supplier of Ria Vial. In Blood Collection Vials with Screw Cap, we provide Plain, Clot accelerator, EDTA K2, EDTA K3, Sodium Fluoride and Lithium Heparin in volumes 1-5 ml in packs of 100. Owing to our enriched industrial experience, we are devoted towards manufacturing a wide variety of excellent quality Cell Culture Tube. So as to cater with the increasing demands of our honored customers, we are readily immersed in offering a wide compilation of Vial Seal. These presented products are designed beneath the management of adroit personnel making using of superior-class basic material. - It is field test, hence water sample can be directly collected from the tap. - No need to remove the chlorine in chlorinated water, since the content of the bottle is instantaneously removes it. - No need to measure the volume of water as the level of label indicates it is 20 ml. 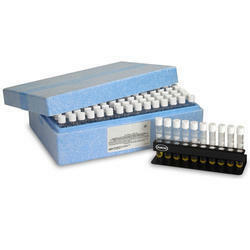 material options: a) pp / pe these sterlized vials having prominent graduations & long marking area for sample identification are normally used for storage of biological material, human & animal cells at temp. As low as -190° c. the longitudonal grooves in the base makes it non-twisting when placed in a rack.